I started to write about learning new software. But no one learns software for its own sake. Software’s like a second language: you learn it because you have a goal. Even the well-intended “everyone should know how to code” silliness has a goal, which is less about coding and more about something like logical thinking, understanding complex systems, or producing a result that the coder finds worthwhile. I decided I wanted to write about two things: why I wanted to learn this particular software, and how I’m not learning the way the program’s developers think I should. I’m not even learning the way I might have thought I should. It’s going to take me a couple of posts; this is the first. Last year, I joined the Victoria Gaelic Choir. Gaelic (Gàidhlig, Scottish Gaelic) was the language of my ancestors and even my grandparents. I know only a few words and phrases, but I’ve know Gaelic singing for a long time–and if you don’t, there’s a list at the end of this post to get you started. And before the lyrics, I needed to learn the melody for many songs I’d never heard. (Tune first, words second; trust me.) Even for those I did recognize, I needed to learn the tenor part. I can pick out a tune or a tenor line on guitar, but that’s not a practical way to learn a choral piece. I seriously considered buying an electronic keyboard, but my son (thank goodness) suggested I experiment with a 30-day trial of Sibelius First. With Sibelius, I know what I’m doing. Or what I should do. This $120 package lets you compose music on your computer and share it with others. I didn’t plan any composition, but the features that caused my son to suggest Sibelius include the ability to scan printed sheet music, to create an editable digital score, and to export sound files. Sheet music to an mp3? Does it work? Let me show, rather than tell. That line of Gaelic above is from Uibhist Mo Ghràidh (Uist, My Love), an archetypal Gaelic song about the island of North Uist, where my mother’s people came from. ann an Eilean Uibhist an eòrna. In the Isle of Uist of the barley. A recording like this demonstrates the melody, and from Wednesday night choir practice I had a nodding acquaintance with the tenor line. But “once a week” takes the idea of spaced practice to an extreme. I needed to hear the tenor part on its own, a lot, so I could practice. I scanned the music into Sibelius. I edited a few errors the scan didn’t quite catch. From the digital version, I exported audio files for each part and for the four parts together. Sibelius allows me to choose instruments–which means I can make the audio sound like piano, or like human voices. I went the latter route. Here’s the full choir audio, and here’s the tenor part. The audio comes out as .wav files. It takes me less than a minute to convert them to mp3s, which I can then send to my phone or share with other members of the choir. That’s where I went. Next time: how I got there. It’s taken me a while to write this post, because I kept rethinking what it was I wanted to learn and how I could explain the context. If I had to summarize my own learning goal, it’d be “have the tune for the tenor parts to Gaelic songs I want to sing.” That’s an oversimplification, but it was also a 14-word target I wanted to hit. It took some effort before I could hit it, and the process of that learning is what will be in the next post. Kathleen MacInnes, Òganaich An Òr-fhuilt Bhuidhe, Young Man with the Golden Hair (lyrics and English translation). The Campbells of Greepe, who start with puirt-à-beul (“mouth music”) meant to imitate instruments and meant to dance to. Karen Matheson, Gleann Bhaile Chaoil, Ballachulish Glen (lyrics and English translation). Runrig, Cearcall a’ Chuain, The Ocean’s Cycle (both Gaelic and English in the video). There are typos in the Gaelic, but you’ll probably overlook them. Provide automatic navigation between posts in a series (so I wouldn’t have to hard-wire the links). Display a list of all the posts in a given series (for me to use as a summary or as a table of contents for the series). If I’d thought about it longer, I might have articulated another goal: have some way to list all the different series I have. But I’m not usually that strategic. Still, what I came up with (provide navigation, display a list) acted as my critical-to-quality elements. CTQs were widely used at GE when I worked there; I use that acronym partly tongue-in-cheek and partly to highlight informal criteria. To me, this is an important distinction for workplace learning: You can learn on your own for your personal satisfaction, and if you’re satisfied, then that’s a sufficient result. In the workplace, though, you’re part of a larger group (even if that group is you and one individual client), and so the result has to matter within that context. What’s this got to do with my plugin tinkering? Think of it as my own workplace learning. At this point, I was still some distance from my (loosely articulated) end state. I hadn’t moved much toward my other CTQ of displaying a list of all the posts in a series. In fact, I didn’t yet grasp all the options in the plugin, let alone know how to make them work in a way useful to me. But…In my first 15 minutes with the plugin, I’d achieved a result that I found valuable. That left me more willing to experiment–which, put another way, says I was somewhat more willing to spend time trying to achieve the next valuable result. To me, this is a core principle for any type of workplace learning: formal or informal, face-to-face or virtual. I need to be able to accomplish something that looks to me like real work–produce something that I see has having on-the-job value. And I need to do that sooner rather than later, which is why twenty minutes on introductions, half an hour on expectations for this workshop, and twenty minutes on learning objectives will invariably drive me to teeth-clenching frustration. Or to eating more of those lowest-bid-hotel pastries. One of the unexpected outcomes of achieving an initial on-the-job goal is that you end up better able to visualize other goals. In a sense, learning leads to new problems (or opportunites) because you’re better at grasping the current situation and at visualizing different ones. You can click that image if you’d like to see the first post in the series, though I’ve turned this “series post list box” feature off for now, until I learn how to control the way it displays. Having managed to produce it, though, I’ve picked up several more goals for myself. I was about to write “learning goals,” but I want to stress that they’re all tied to accomplishment. I want to learn how to use code that’s part of the plugin to, for example, display a list of posts like the last example where and when I want it. I want to find out how to modify the plugin’s template (the tool it uses to display the full text of all the posts in a series). I may even want to learn how to modify the PHP or CSS code to make things happen. That last is quite a goal for someone who doesn’t really know how to program. But my various experiments to date, and especially the things I see as successes, have taught me that I can learn to successfully modify small bits of PHP code and achieve relatively high-value results. So I’m accomplishing what looks like real work to me. Dave’s Whiteboard marked its fifth anniversary last month. (No, I didn’t notice, either.) You might not think it, given my recent output, but my Whiteboard means a lot to me — so much so that whenever I think about changing the theme (the package of files that controls the appearance) I end up considering one that looks much like what I’m currently using. Sticking with what I’ve had has more and more often meant I run into technical problems. My current theme is out of date in several ways–for example, it’s not widget-aware. That means is that I can’t take advantage of simple ways to customize and control the appearance. I’ve occasionally written several posts on a single topic (a series of posts). At the time I used a WordPress addon (a plugin) that automatically added previous/next links so that a reader could work through a series without worrying about date or about intervening but unrelated posts. That same plugin created a table of contents as well, so you could tell where you were in the series. That plugin stopped working a few months back; I have no idea why. The effort to manually input the links–to hard-wire them, so to speak–was more than I was ready to expend. Still, I plan to write a series or two in the coming months, and I wanted to have a low-maintenance way to present all my series. So this past weekend I started experimenting with the Organize Series plugin. I tested to see if it could link the three posts in my series about the book Improving Performance, by Rummler and Brache. I had to do some tinkering, and I had to purchase a $15 add-on for the plugin, but I’m content so far: I’ve accomplished my short-term goal of making each of my series work like a series again–without a lot of hand wiring. Enough WordPress mumbo-jumbo. I’m going to revisit this from the perspective of learning on the job. My hunch is that there’s a kind tradeoff that a person’s willing to make when he has a problem to solve (or an opportunity to seize). What going into figuring worth is the amount of effort expended, and the value of the results… as seen by the person with the problem or opportunity. CC-licensed photo by Craig Bennett / theclyde. 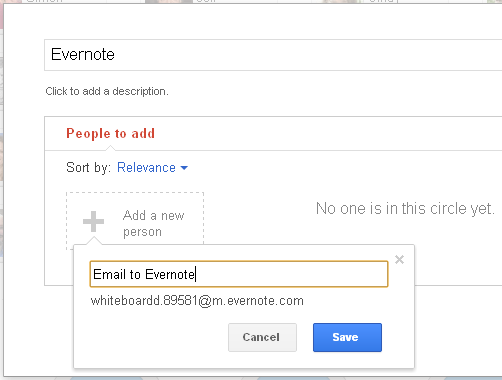 Here’s an easy way to save items from your Google Plus stream to Evernote. At the bottom of the Settings page, you’ll see Emailing to Evernote. That’s where you’re find your Evernote email address. 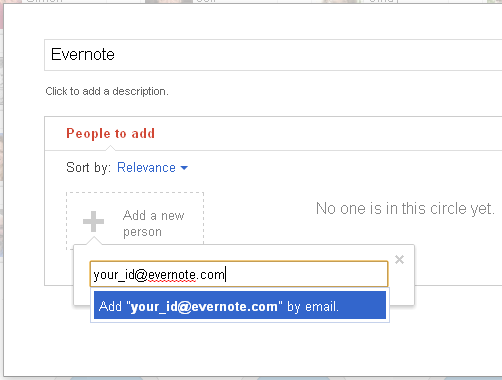 Step 3: Click “add a new person.” Enter your Evernote email address. Enter your Evernote email address. Google+ reminds you that someone in that circle isn’t yet on Google+. They mean “your Evernote email isn’t,” which is true. You can share the item with additional people or circles, but I’m trying to stay simple here, so I just click Share. I don’t know if Google+ is being solicitous or just fretful, but when you do click Share, you’ll get a second reminder that someone you’re sharing with isn’t on Google+ and will have to settle for email. Confirmation (part two), or, are you sure you're sure? 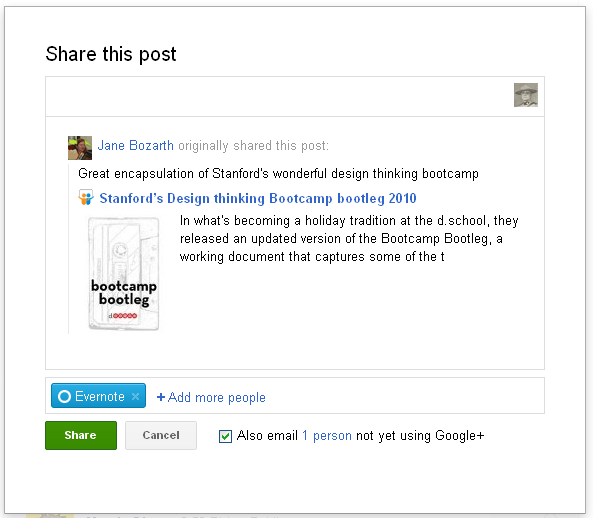 Within a minute of my having shared the item in Google+, Evernote had it in my default notebook. The only quibble I have here: the item received by Evernote comes from me — I was sharing stuff in my stream with Evernote, right? And so, if it’s an item that someone else posted (one that was in my stream, but not originally from me), there’s no indication in Evernote of who originally shared the item. 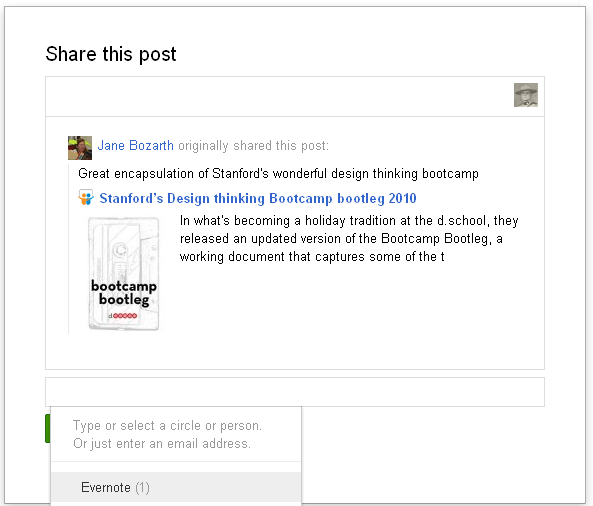 If I click that “view or comment” link in the Evernote note, I will see the item as it originally appeared in my stream — with, in this example, a link to Jane Bozarth, who originally shared the item. I’m grateful to Beth Kanter, who’s shared a number of useful Google+ tips, and to Vikki Baptiste, whose comment on one of those tips led me to search for the details of how to do this. I’ve been trying to get better control over the projects I work on and the data related to those projects. So this isn’t me avoiding work; this is me reprocessing by talking about the challenges I felt and then about how I’ve tried to address them. That sounds like mainly organization and housekeeping, but if you rise above the roadway, it’s managing. I wanted to do better at managing both work and non-work projects. I figured if I could accomplish any of those things in the list, and especially more than one at once, I’d be far more likely to get a project done. Or at least get it moving. Retention–whatever’s in the system is ultimately in my own custody, not solely a wisp in someone else’s cloud bank. Ubiquity–a system that I could use in my office, on a client site, or somewhere else. Dwell time–an increased ability for me to stay with the task at hand. Was that a wrong note? Evernote lets you create individual notes, store them in virtual notebooks, and access them on your own computer, from any computer, or through a smartphone–hey, ubiquity! The database with your notes is stored not only on their servers (which you don’t own) but also on your PC, with automatic synchronization. You can cloudify if you like, but having a local copy of the database helps satisfy my CTQ for retention. I’d been cruising a predictable arc, from an initial everything-fits enthusiasm to a distressing suspicion that I’d reinvented the junk drawer. To be is to be done? On a separate track, I’d been reading David Allen’s Getting Things Done. I approached this book with hesitation, or more accurately evangeloskepticism, because of the… well, let’s say, the ardor of some GTD adherents. The people who always say “GTD.” If they were Apple users, they’d be the ones who care about the code name for the next operating system. Messy and distractable I may be, but I appreciate the advantages of a system, even if I sometimes appreciate it from afar. Allen’s approach is more about thinking systematically than about particular tools–though you can, if you desire, buy a set of 43 plastic file folders for only $39.95 (plus shipping). So I’ve been applying elements of that system, and adjusting the way I work with my paper files and with Evernote, and I’m happy with how the results look so far. Two useful, intertwined concepts: first, a task is something you can complete in a single chunk of time. “Peel the carrots” is a task. If you’re like me, “do the grocery shopping” is also a task; I may have a big list of items, but I get them in one trip. Which leads to the second useful concept: you don’t do a project, you do the next step. From a manage-your-work perspective, think of the project as the goal you want to achieve (groceries purchased, workshop delivered, kitchen remodeled). You revisit the project to generate thoughts about what the next steps might be. When you don’t have any more steps, the project’s done. So I create what I call a project page, which is a highfalutin name for a note on which I put a short description of the goal of the project, along with a timeframe (however nebulous) and the tag I’ve chose for that project. I’ll also use the project page to jot notes about ideas related to the project. That means the project page becomes a kind of greenhouse where idea seedlings can germinate until they turn into action steps. Action steps (things I can do) become separate notes, each tagged as part of the project. 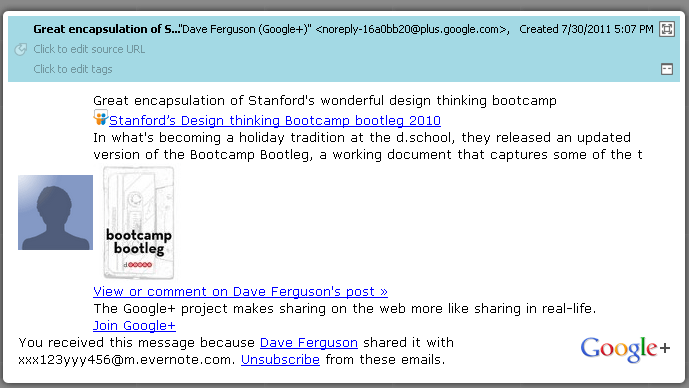 So do reference items, like email that I forward to Evernote, making the contents of the email more readily searchable. So do things like PDF documents, which can be dragged into their own note. Previously, I had more than a dozen project-specific notebooks in that sidebar. And if I create a new notebook for any multi-step effort I have (even small one with long duration, like “get a digital copy of the LP that Mom has no turntable for”), I could easy have three or four dozen. This works better. And I can do the same sort of selective display across multiple notebooks. David Allen suggests putting all your project-support material (things that don’t require an action but that you want to retain) into a reference file. He leaves the form of that file up to you, though he’s quite the fan of a single, alphabetical-order, paper filing system. I have those, but I prefer keeping digital (i.e., searchable) copies, which now go into a Reference notebook. Allen might be less in favor of a separate location for the work-specific diaries that I call project logs, so if you see him, don’t tell him that’s what I have. I tend to make the logs for large projects; for small ones, I’ll jot ongoing notes on the project page. Not necessarily consistent, but, oh, well. More than a third of my Evernote items are in the REFERENCE notebook. To me, this makes sense. For active projects, a lot of the relevant material isn’t a trigger for action; it’s project support. It’s reference material. If an item appears useful to more than one project, I apply multiple project tags. That way it’ll show up in project-specific searches. I also have a Project Archive notebook. When I complete a project, I select all its items from the Projects notebook and move them to the archive. Why? Because that’s what I’ve always done. The Projects notebook and the Project Archive account for another 20% of my notes, which means that together with Reference, half of what I keep in Evernote is in just three notebooks. Speaking of pragmatism, this post is long enough. I have a follow-up underway with some more examples of what I’ve tried and what results I’ve gotten. Evernote examples are my own. CC-licensed images: dwell time by Owen Blacker. Junk drawer by windsordi / Di Bédard. Archive of papers by Ben McLeod.